Leonardo da Vinci was a Florentine artist, one of the great masters of the High Renaissance, who was also celebrated as a painter, sculptor, architect, engineer, and scientist. His profound love of knowledge and research was the keynote of both his artistic and scientific endeavors. His innovations in the field of painting influenced the course of Italian art for more than a century after his death, and his scientific studiesparticularly in the fields of anatomy, optics, and hydraulicsanticipated many of the developments of modern science. Leonardo was born on April 15, 1452, in the small Tuscan town of Vinci, near Florence. He was the son of a wealthy Florentine notary and a peasant woman. 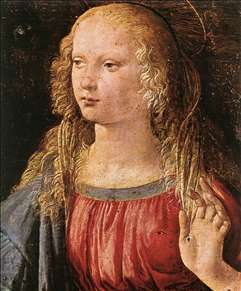 In the mid-1460s the family settled in Florence, where Leonardo was given the best education that Florence, the intellectual and artistic center of Italy, could offer. He rapidly advanced socially and intellectually. He was handsome, persuasive in conversation, and a fine musician and improviser. About 1466 he was apprenticed as a garzone (studio boy) to Andrea del Verrocchio, the leading Florentine painter and sculptor of his day. In Verrocchio s workshop Leonardo was introduced to many activities, from the painting of altarpieces and panel pictures to the creation of large sculptural projects in marble and bronze. 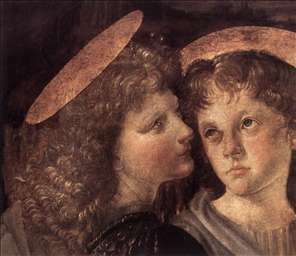 In 1472 he was entered in the painter s guild of Florence, and in 1476 he is still mentioned as Verrocchio s assistant. 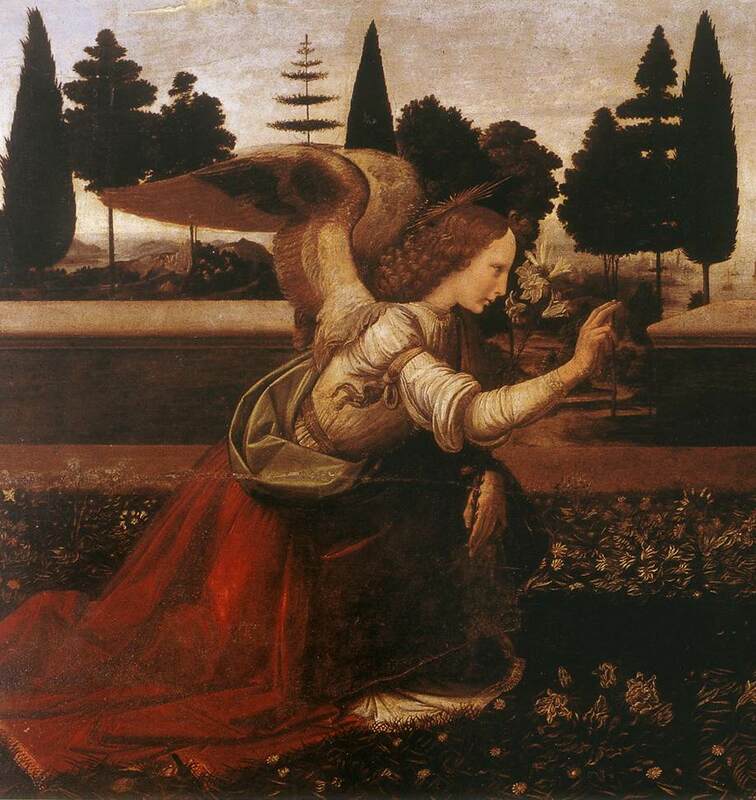 In Verrocchio s Baptism of Christ (circa 1470, Uffizi, Florence), the kneeling angel at the left of the painting is by Leonardo. In 1478 Leonardo became an independent master. His first commission, to paint an altarpiece for the chapel of the Palazzo Vecchio, the Florentine town hall, was never executed. His first large painting, The Adoration of the Magi (begun 1481, Uffizi), left unfinished, was ordered in 1481 for the Monastery of San Donato a Scopeto, Florence. Other works ascribed to his youth are the so-called Benois Madonna (c. 1478, Hermitage, Saint Petersburg), the portrait Ginerva de Benci (c. 1474, National Gallery, Washington, D.C.), and the unfinished Saint Jerome (c. 1481, Pinacoteca, Vatican). 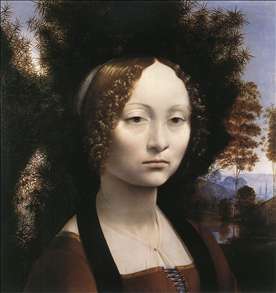 About 1482 Leonardo entered the service of the duke of Milan, Ludovico Sforza, having written the duke an astonishing letter in which he stated that he could build portable bridges; that he knew the techniques of constructing bombardments and of making cannons; that he could build ships as well as armored vehicles, catapults, and other war machines; and that he could execute sculpture in marble, bronze, and clay. He served as principal engineer in the duke s numerous military enterprises and was active also as an architect. In addition, he assisted the Italian mathematician Luca Pacioli in the celebrated work Divina Proportione (1509). Evidence indicates that Leonardo had apprentices and pupils in Milan, for whom he probably wrote the various texts later compiled as Treatise on Painting (1651; trans. 1956). 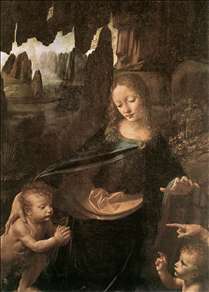 The most important of his own paintings during the early Milan period was The Virgin of the Rocks, two versions of which exist (1483-85, Louvre, Paris; 1490s to 1506-08, National Gallery, London); he worked on the compositions for a long time, as was his custom, seemingly unwilling to finish what he had begun. From 1495 to 1497 Leonardo labored on his masterpiece, The Last Supper, a mural in the refectory of the Monastery of Santa Maria delle Grazie, Milan. Unfortunately, his experimental use of oil on dry plaster (on what was the thin outer wall of a space designed for serving food) was technically unsound, and by 1500 its deterioration had begun. Since 1726 attempts have been made, unsuccessfully, to restore it; a concerted restoration and conservation program, making use of the latest technology, was begun in 1977 and is reversing some of the damage. Although much of the original surface is gone, the majesty of the composition and the penetrating characterization of the figures give a fleeting vision of its vanished splendor. During his long stay in Milan, Leonardo also produced other paintings and drawings (most of which have been lost), theater designs, architectural drawings, and models for the dome of Milan Cathedral. His largest commission was for a colossal bronze monument to Francesco Sforza, father of Ludovico, in the courtyard of Castello Sforzesco. In December 1499, however, the Sforza family was driven from Milan by French forces; Leonardo left the statue unfinished (it was destroyed by French archers, who used it as a target) and he returned to Florence in 1500. In 1502 Leonardo entered the service of Cesare Borgia, duke of Romagna and son and chief general of Pope Alexander VI; in his capacity as the duke s chief architect and engineer, Leonardo supervised work on the fortresses of the papal territories in central Italy. In 1503 he was a member of a commission of artists who were to decide on the proper location for the David (1501-04, Accademia, Florence), the famous colossal marble statue by the Italian sculptor Michelangelo, and he also served as an engineer in the war against Pisa. Toward the end of the year Leonardo began to design a decoration for the great hall of the Palazzo Vecchio. The subject was the Battle of Anghiari, a Florentine victory in its war with Pisa. He made many drawings for it and completed a full-size cartoon, or sketch, in 1505, but he never finished the wall painting. The cartoon itself was destroyed in the 17th century, and the composition survives only in copies, of which the most famous is the one by the Flemish painter Peter Paul Rubens (c. 1615, Louvre). 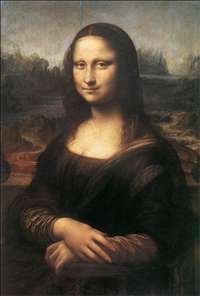 During this second Florentine period, Leonardo painted several portraits, but the only one that survives is the famous Mona Lisa (1503-06, Louvre). One of the most celebrated portraits ever painted, it is also known as La Gioconda, after the presumed name of the woman s husband. Leonardo seems to have had a special affection for the picture, for he took it with him on all of his subsequent travels. In 1506 Leonardo went again to Milan, at the summons of its French governor, Charles d Amboise. The following year he was named court painter to King Louis XII of France, who was then residing in Milan. For the next six years Leonardo divided his time between Milan and Florence, where he often visited his half brothers and half sisters and looked after his inheritance. In Milan he continued his engineering projects and worked on an equestrian figure for a monument to Gian Giacomo Trivulzio, commander of the French forces in the city; although the project was not completed, drawings and studies have been preserved. From 1514 to 1516 Leonardo lived in Rome under the patronage of Pope Leo X: he was housed in the Palazzo Belvedere in the Vatican and seems to have been occupied principally with scientific experimentation. In 1516 he traveled to France to enter the service of King Francis I. He spent his last years at the Chteau de Cloux (later called Clos-Luc), near the King s summer palace at Amboise on the Loire, where he died on May 2, 1519. Although Leonardo produced a relatively small number of paintings, many of which remained unfinished, he was nevertheless an extraordinarily innovative and influential artist. During his early years, his style closely paralleled that of Verrocchio, but he gradually moved away from his teacher s stiff, tight, and somewhat rigid treatment of figures to develop a more evocative and atmospheric handling of composition. The early The Adoration of the Magi introduced a new approach to composition, in which the main figures are grouped in the foreground, while the background consists of distant views of imaginary ruins and battle scenes. Leonardo s stylistic innovations are even more apparent in The Last Supper, in which he re-created a traditional theme in an entirely new way. Instead of showing the 12 apostles as individual figures, he grouped them in dynamic compositional units of three, framing the figure of Christ, who is isolated in the center of the picture. Seated before a pale distant landscape seen through a rectangular opening in the wall, Christwho is about to announce that one of those present will betray himrepresents a calm nucleus while the others respond with animated gestures. In the monumentality of the scene and the weightiness of the figures, Leonardo reintroduced a style pioneered more than a generation earlier by Masaccio, the father of Florentine painting. The Mona Lisa, Leonardo s most famous work, is as well known for its mastery of technical innovations as for the mysteriousness of its legendary smiling subject. 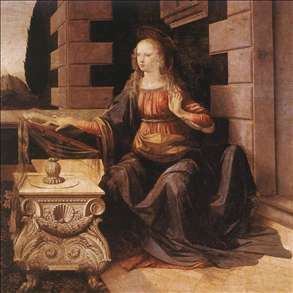 This work is a consummate example of two techniquessfumato and chiaroscuroof which Leonardo was one of the first great masters. Sfumato is characterized by subtle, almost infinitesimal transitions between color areas, creating a delicately atmospheric haze or smoky effect; it is especially evident in the delicate gauzy robes worn by the sitter and in her enigmatic smile. Chiaroscuro is the technique of modeling and defining forms through contrasts of light and shadow; the sensitive hands of the sitter are portrayed with a luminous modulation of light and shade, while color contrast is used only sparingly. 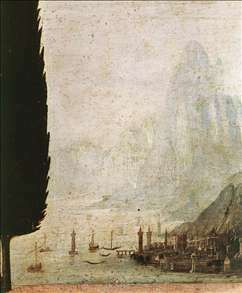 An especially notable characteristic of Leonardo s paintings is his landscape backgrounds, into which he was among the first to introduce atmospheric perspective. The chief masters of the High Renaissance in Florence, including Raphael, Andrea del Sarto, and Fra Bartolommeo, all learned from Leonardo; he completely transformed the school of Milan; and at Parma, Correggio s artistic development was given direction by Leonardo s work. Leonardo s many extant drawings, which reveal his brilliant draftsmanship and his mastery of the anatomy of humans, animals, and plant life, may be found in the principal European collections; the largest group is at Windsor Castle in England. Probably his most famous drawing is the magnificent Self-Portrait (c. 1510-13, Biblioteca Reale, Turin). Because none of Leonardo s sculptural projects was brought to completion, his approach to three-dimensional art can only be judged from his drawings. The same strictures apply to his architecture; none of his building projects was actually carried out as he devised them. In his architectural drawings, however, he demonstrates mastery in the use of massive forms, a clarity of expression, and especially a deep understanding of ancient Roman sources. As a scientist Leonardo towered above all his contemporaries. His scientific theories, like his artistic innovations, were based on careful observation and precise documentation. He understood, better than anyone of his century or the next, the importance of precise scientific observation. Unfortunately, just as he frequently failed to bring to conclusion artistic projects, he never completed his planned treatises on a variety of scientific subjects. His theories are contained in numerous notebooks, most of which were written in mirror script. Because they were not easily decipherable, Leonardo s findings were not disseminated in his own lifetime; had they been published, they would have revolutionized the science of the 16th century. Leonardo actually anticipated many discoveries of modern times. In anatomy he studied the circulation of the blood and the action of the eye. He made discoveries in meteorology and geology, learned the effect of the moon on the tides, foreshadowed modern conceptions of continent formation, and surmised the nature of fossil shells. He was among the originators of the science of hydraulics and probably devised the hydrometer; his scheme for the canalization of rivers still has practical value. He invented a large number of ingenious machines, many potentially useful, among them an underwater diving suit. His flying devices, although not practicable, embodied sound principles of aerodynamics. A creator in all branches of art, a discoverer in most branches of science, and an inventor in branches of technology, Leonardo deserves, perhaps more than anyone, the title of Homo Universalis, Universal Man. See more details about "The Baptism of Christ "
See more details about "Annunciation"
See more details about "Virgin of the Rocks "
See more details about "Mona Lisa (La Gioconda)"
See more details about "Annunciation "
See more details about "Portrait of Ginevra de' Benci"